HISTORY OF VIOLENCE Davis plays an activist trying to protect her community from a government experiment in McMurray's prequel to the horror series. When I reviewed the cheesy dystopian thriller The Purge in 2013, I never dreamed it would still be spawning sequels five years later. Or that the fourth installment would preach resistance using none-too-subtle references to current events. True, the premise of the Purge movies was always as politically charged as it was outlandish. In near-future America, for 12 hours each year, all crimes are legal. This annual bonanza of violence lowers crime and unemployment the rest of the year, we're told, and the ruling party, the New Founding Fathers of America, sells it as a revival of the American dream. The first movie, set in a gated suburban community, never clarified exactly how the Purge was supposed to make the nation healthier and wealthier. Moving to inner-city settings, The Purge: Anarchy and The Purge: Election Year gradually revealed what most viewers already suspected: The Purge isn't just about giving brutality an outlet, it's about culling the poor. That's heavy material for a series of ultra-violent, cliché-ridden B movies, but The First Purge leans into it. The first entry directed by Gerard McMurray rather than series creator James DeMonaco, this prequel takes us back to the Purge's trial phase, when it was a controversial experiment launched on Staten Island. We watch an ensemble cast prepare for the night of government-ordered anarchy. The local drug kingpin (Y'lan Noel) instructs his lieutenants to keep a tight ship and avoid the fray, but one of them has other ideas. 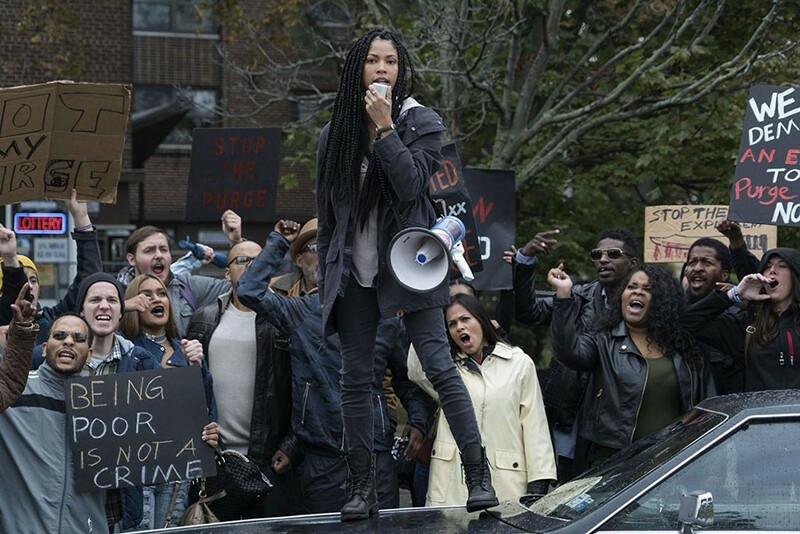 Community-minded Nya (Lex Scott Davis) helps friends and neighbors hunker down in a barricaded church, while her younger brother (Joivan Wade) plots to gun down the unhinged addict Skeletor (Rotimi Paul). Unluckily for him, the Purge is all the excuse Skeletor needs to fulfill the promise of his name. The film cuts from on-the-ground action to media coverage to the reactions of the puppet masters in Washington, D.C., where the Purge's creator (Marisa Tomei) frets when she learns that most Staten Islanders are partying the night away rather than pummeling one another. She needn't worry, though, nor do viewers waiting for things to get bloody. The Purge series has it both ways: Premised on the notion that most people wouldn't actually turn homicidal if given the chance, it gets plenty of mileage out of those who would — some of whom wear badges. McMurray's predilection for extreme, sweaty close-ups leaves some of the action sequences less than clear. Overall, though, he delivers the goods with a climactic showdown in a housing project, and there's no denying the disturbing power of the movie's visual references. One scene cuts ominously away as cops surround a fallen African American; another re-creates the torch-bearing marchers in Charlottesville, Va.
Is it cheap to stick this imagery in an exploitation film? Is it irresponsible? Maybe, but the transparent social commentary of The First Purge is no more inflammatory than your average Facebook political meme, and it doesn't pretend to deliver literal truth. The characters may be wafer-thin, but the movie backs up its bid for relevance with Nya's fiery rhetoric about a system that keeps down people of color, who also compose most of the cast. The First Purge harks back to a grubbier, less focus-grouped age of cinema: the 1970s, when zombie and karate and vigilante movies reflected the nation's turmoil, displaying their politics — left or right — with pride. If B movies once served as the nation's real collective catharsis, maybe it's time to revive them. The original print version of this article was headlined "The First Purge"
The First Purge is not showing in any theaters in the area.